We are seeing normal corrective declines in the broader indexes of late. December has been volatile from day one. Tax selling is obvious to me, and we are seeing extreme oversold set ups in Energy stocks. Insiders have been loading up the last few weeks yet those same stocks are still declining, and we think Hedge funds are taking on heavy losses, and selling is begetting selling. Also, the percentage of stocks above their 50 day moving averages hit the mid 60’s recently which is pretty high. Currently at 53% still and likely to fall further into year end? We also look at the NASI Summation index, and that is topping and rolling over… another topping signal. So the likelihood is we are in early stages of a wave 2 correction from 2070 SP 500 highs after a 250 point rally. Initial support is at the 1994-2000 area for starters, so let’s see if that area holds. The DOW we want to see 17000 support, and its not just a number I made up its a key support line. NASDAQ look for initial key support at 4617 and 4457 below that. Biotech stocks are very inflated here, though I like them and have profited. They seem like the end of season rotation to save some Portfolios and window dressing. Looking for Energy stocks to be the January rebound winner candidates. Need to see GOLD over 1241 on Closing basis before I start getting bullish. www.MarketTrendForecast.com Join us for a 33% discount! The Chinese Shanghai Composite Index broke to the upside in July and has rallied a good 15% since then. For an Index alone this is quite impressive, equivalent to the Dow Jones rallying 2500 points or so here on a relative basis. Our opinion is this is Bullish for US stocks as it can only mean commerce is picking up in China after a period of consolidation. We have been bullish on the US listed Chinese stocks all year long and have traded in and out of them successfully at our ATP service. Below we have the US SP 500 index chugging along bouncing off the weekly trendlines during this Primary Wave 3 upside move. We maintain our 2213 target, which is a 161% relationship to Primary Wave 1 which was 704 points in upside length. Our opinion is this type of Bullish action in the Chinese names is only adding fuel to the fire that is the Elliott Wave Primary Wave 3 pattern we are in. Wave 3’s in Elliott Wave Theory are very bullish in terms of sentiment by investors. All dips are bought, good news is great, bad news is good and so forth. Wars, bombs, bank failures in Europe, deflation and any other pots and pans are deflected as investors feel the euphoria. This should likely continue until we get in the 2200 SP 500 ranges, and once there the fibonacci relationship of Primary Wave 1 to Primary Wave 3 will begin to exert resistance on the uptrend. At our Trading Service we have simply continued to ride the Primary Wave 3 trend to the upside, and rotate into the stronger sectors as they rotate. We began getting aggressive with the Chinese stock names several months ago as we felt they were bottoming out in May of this year. Companies like JMEI, LEJU, TEDU, YY and so forth have been great trading and growth stock names. Though the Chinese names are a bit extended, the growth rates relative to PE ratios are attractive as compared to their US brethren, and we expect to continue to exploit this until the gap closes or the sentiment exhausts itself. http://www.themarkettrendforecast.com/wp-content/uploads/2013/08/TMTF-word-header.jpg 0 0 admin http://www.themarkettrendforecast.com/wp-content/uploads/2013/08/TMTF-word-header.jpg admin2014-09-08 08:26:242014-10-22 03:21:10Chinese Stocks Pulling US Stocks Higher? Both charts on the SP 500 and GOLD remain bullish. It appears that GOLD is forming a rare Stage One base pattern while at the same time forming a Bullish Triangle. This means a large move is coming very soon, we expect to the upside… but for sure this Precious Metals market has lulled everyone to sleep… may need to wake up soon. 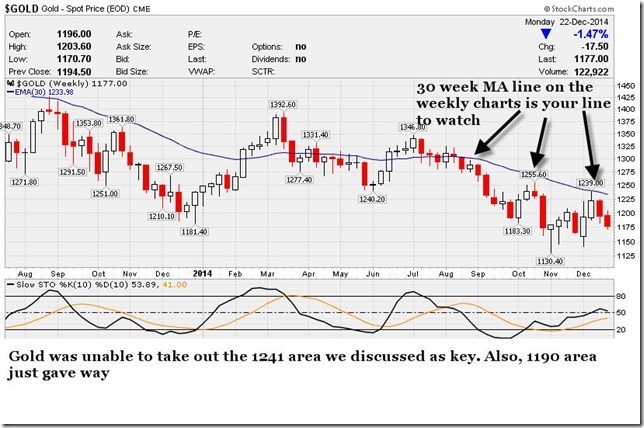 Gold and The US Dollar– Where are we at? So this has led partially to the fall-off in Gold from 1346 to 1281 recent dip lows. Interesting that at $1281 we have a perfect 61% fibonacci retracement of the prior $106 rally from 1240-1346. We would like to see 1281 area hold for a new rally, and right now the US dollar is overbought as well. The counter balancing issue though is the Commitment of Traders report is showing the smart money commercial traders with very large short (Hedged) positions in GOLD… that is creating uncertainty for traders as well. Join us at www.markettrendforecast.com to subscribe to our premium TMTF service with a nice coupon discount today! http://www.themarkettrendforecast.com/wp-content/uploads/2013/08/TMTF-word-header.jpg 0 0 admin http://www.themarkettrendforecast.com/wp-content/uploads/2013/08/TMTF-word-header.jpg admin2014-08-05 09:31:452014-10-22 03:20:51Gold and The US Dollar-- Where are we at?